Photo by 46137. What would you pair with pork tenderloin? Rules are meant to be broken, right? So why is it that we tend to hold on to hard and fast rules when it comes to drinking wine? Historically speaking, wine was reserved for the upper echelons of society, a tipple meant exclusively for the wealthy and culturally aloof. Well, lucky for us non-wealthy, non-highfalutin’ wine lovers, times have changed—and so have the pretentious and long-ingrained rules that dictate the way we think about and drink wine. Do you always pair red wine with meat? Do you only cook with wine that’s good enough to actually drink? If you’re nodding “yes” to these questions, then read on to learn about four old-school wine rules that are absolutely rubbish! 1. Always pair white wines with fish and red wines with meat. Although pairing white wines with fish and red wines with meat can act as a good starting point for learning how to pair wine with food, the truth is that successful pairings involve much more than the actual protein that’s being featured in a dish. For starters, try to assess the lightness or heaviness of a dish and this will help point you towards an apt wine pairing. For instance, yellowfin tuna is quite meaty and steak-like in texture when compared to white-fleshed fish like rainbow trout or striped bass, which are lighter, flakier, and more delicate. Due to its robust flavor and texture, tuna can easily stand up to both light and medium-bodied red wines such as pinot noir or sangiovese. 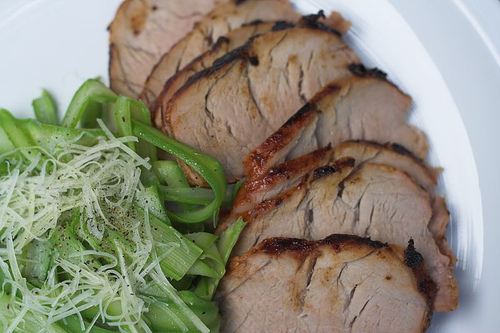 The same goes for a lighter-style meat dish like roasted pork tenderloin. Tenderloin is lean enough and light enough in flavor to marry beautifully with a light-to-medium-bodied aromatic white wine like a grüner veltliner or a viognier. Another key element to brilliant food and wine pairings: match the wine not to the main protein in a dish, but to the sauce, glaze, dressing or spices featured in that dish. Black cod, for example, is a rich, flaky, white-fleshed fish that most people would automatically pair with a white wine, but when broiled with a Japanese miso glaze, black cod can pair wonderfully with fruity red wines like zinfandel or cru Beaujolais, which will pick up the caramelized sweetness in the miso glaze. Spicy Thai beef salad is another great example. Most people would pair this dish with a red wine since it contains red meat. However, if you focus on the salad’s sweet, tart and spicy dressing when choosing a wine pairing, you’ll reap the rewards. The lime-driven acidity, sugar and spicy Thai chiles used in the dressing will pair much better with a high-acid, slightly sweet wine like an off-dry riesling than with a big, tannic red wine like a cabernet sauvignon. Tannic wines intensify the sensation of heat in a dish, so opt for low-tannin wines when pairing wine with spicy foods. Moreover, the sugar in the dressing will clash with a dry red like a cabernet, which can make the wine taste sour, so stick with a wine that has a good dose of residual sugar to match the dish’s sweetness. 2. Never cook with a wine that you wouldn’t actually drink. The exact origins of this myth are unclear, but whoever told you to dump a bottle of $50 Barolo into your braised short rib broth is flat-out wrong! When wine is used to fortify a braising liquid for meat or a pasta sauce like Bolognese, its function is to contribute acidity, fruity depth, and for all intents and purposes, liquid volume. The alcohol in the wine cooks off while the wine reduces, as do all of the other factors that make wine drink-worthy or not, so reserve your brunello for your Riedel glass and use two-buck chuck in your next braised brisket. 3. To truly appreciate wine, you must have an encyclopedic knowledge of world wine regions and grape varieties. Knowing the difference between limestone and granite soils may make you a more discerning wine drinker, but don’t let your lack of geeky wine knowledge deter you from enjoying what’s in your glass. People get extremely intimidated by the seemingly infinite number of grape varieties that thrive on our planet, or by the hundreds of appellations that comprise the French wine landscape, but none of this is imperative to having a truly enjoyable wine drinking experience. What’s more important than being able to pronounce “trockenbeerenauslese” is knowing what you like and what you don’t like. Start with a grape variety—say syrah—taste a few examples from different countries and different wineries, and then decide yea or nay. Move on to another grape variety, say albariño, and soon enough you’ll be educating your friends about the coastal vineyards of Rias Baixas in Spain. 4. Wine should be drunk only with formal, fancy food. While Sauternes and foie gras are a match made in heaven, I challenge you to claim that a blistering fennel-sausage pizza and a bottle of high quality lambrusco are anything less than genius when had together. Wine should have a place in people’s everyday lives, the same way burgers, Indian take-out, and carnitas tacos do—so move beyond the notion that wine should only be consumed at a restaurant with white tablecloths, and break out your favorite bottle next time you’re digging into your weekly pad thai. Editor’s Note: What “rules” do you obey when you choose a wine to pair with your meal? We’d love to hear what you think! Etty Lewensztain is the owner of Plonk Wine Merchants, an online shop focused on small-production, artisanal and altogether great cheap wine. The food- and wine- obsessed Los Angeles native cut her teeth in the wine biz running a marketing campaign to promote Chilean wine in the United States, and is certified by the esteemed Wine & Spirit Education Trust (WSET) and the American Sommelier Association. Plonk Wine Merchants specializes in hidden gems from around the globe and every bottle in the store is priced below $30. Follow Plonk Wine Merchants on Twitter @ PlonkOnline.